(CHEMUNG, N.Y.) – In what has been a bitterly cold off-season from racing, the racing community surrounding the pavement racing scene in the Twin Tiers has been swirling. Opinions regarding schedules and a nearby track discussing re-opening seems to have been the biggest buzz. One of the players in the pavement racing scene is John White, owner and promoter at the Chemung Speedrome. White released their season schedule several weeks ago, with many expressing their displeasure for a schedule that will not begin until Saturday June 2. For White though, the answer for the later start was simple. “May is always a tough month and we have fought it for years,” White explained. But it’s not just the grounds that cause concern for the track with the wet Spring time weather. That track can also be a major concern when dealing with wet weather. White spoke about the track schedule for the impending 2018 season and noted that the track’s test and tune session is slated for Saturday May 26 at 5:00. Prior to that time, the track is available for anyone that wishes to rent the facility for a paid private practice session. Racers wishing to get that time are encouraged to call White by phone at (631) 745-9805. 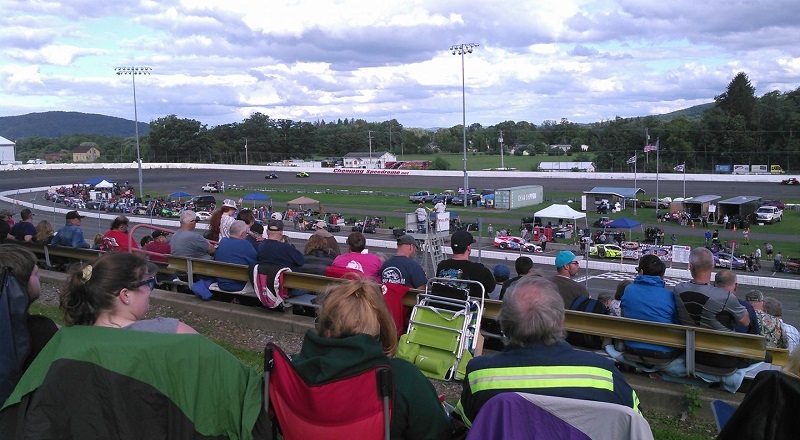 The first race on the Chemung schedule is set for Saturday June 2, as Whelen Engineering will host the Sunoco Modifieds (40 laps), Super Stocks (25 laps), 4-Cylinders (20 laps), INEX Legends (20 laps) and the Bandoleros (8 laps). In a recent edition of the Morning Times, Shangri-La 2 owner and promoter George Swansbrough had some sharply worded comments regarding his track’s return to the racing scene in the Twin Tiers. “We are running Saturday nights in 2018 and 2019,” said Swansbrough when speaking to the Morning Times after an informational meeting was held in Sayre on Thursday March 8. Swansbrough spoke to a bitter relationship between the two tracks and named several off-the-record incidents that have taken place that have built such a divide between the facilities located less than thirty minutes apart down Interstate 86. When asked on March 8, Swansbrough admitted that he had never met White face-to-face. “George has said in public that we have never met and that is absolutely true- I have never met the man,” White agreed. Just because the two have never met, coupled with Swansbrough’s recent comments doesn’t mean White has written off potential meetings or communications to discuss what will best help the local racing community. Though both tracks plan to race on Saturdays in 2018, the initial planning of schedules doesn’t seem to create any scheduling conflicts. But the question that remains to be answered is would a full schedule of Saturday nights in 2019 at Shangri-La 2 cause White and his staff to rethink their schedule for next year? Would a return to Friday night racing at “The Drome” be on the table? 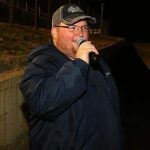 Steven Ovens is the Northeast Dirt Correspondent for Race Chaser Online and the creator and host of the Turn 5 Live dirt track racing radio show, part of the Performance Motorsports Network. The 31-year-old has a career in the growing health care business world, and is also entering his third season as the full-time announcer and media director for Woodhull Raceway in Woodhull, N.Y. In addition, Ovens was formerly the announcer and media director for Outlaw Speedway (formerly Black Rock Speedway) in Dundee, N.Y., serving in that capacity in both 2015 and 2016.